THe Wandle Industrial Museum in Mitcham is a riverside museum reflecting the rich heritage of of the Wandle Valley. The museum displays evidence which establishes that the River Wandle was, in its day, the most industrialised river in Europe. In 1983 the Wandle Industrial Museum was established to help preserve the story of the river and the industries it helped to support. The museum is entirely run by volunteers. Exhibitions concentrate on two of the Wandle's better known industries, namely the snuff & tobacco and textile industries. The 'Lost Mills of the Wandle' exhibition tells the story of mills founded at Croydon, Carshalton, Mitcham, Merton, Wimbledon and Wandsworth. The museum also highlights Merton Priory, and has a display on the Surrey Iron Railway, a horse-drawn toll railway, which opened in 1802. The River Wandle rises in Croydon and Carshalton, and winds for 11 miles to join the Thames at Wandsworth. The swiftly flowing water made the Wandle perfect to power waterwheels, and as a result the river has been used since the late Saxon period as a centre for numerous industries. First came corn mills, grinding grain for food, then came fulling mills. From the 17th century water power was used to make iron, copper, dye, gunpowder, and paper, followed by oils, cloth, and tobacco snuff. At the height of its industrial activity the Wandle supported around 50 mills. Many of these historic industries are still produced along the Wandle, though they no longer use water power. As taking snuff became fashionable in the 18th century many of the former grain mills along the Wandle were converted into snuff mills. Snuff is made from finely ground tobacco leaves, and local mills often added dried herbs found locally to create a unique flavour. The most popular herbs were peppermint and lavender, grown at Mitcham. The museum has a collection of finely crafted snuffboxes and bottles showing how the fashion for snuff changed and grew. Among famous firms to use the Wandle as their base are Liberty (the Regent Street store printed silk here), the Surrey Iron Railway, Connolly's Leather, William Morris & Co., and Young's Brewery. The museum has the only known model of the Morris & Co works in Merton. 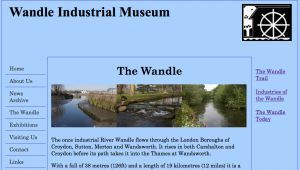 The Wandle Industrial Museum has helped create 'The Wandle Trail', a walking and cycling trail that follows the river's course past industrial landmarks and other places of interest. Location: Off the A217. Parking along nearby streets. 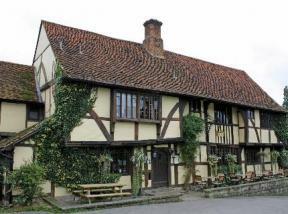 Nearest rail station is Mitcham Eastfields, a 20 minute walk away. See the museum website for more public transport options.